I am a big fan of Rockabilly music, in particular Elvis Presley, Bill Haley & His Comets, Robert Gordon, and The Stray Cats. 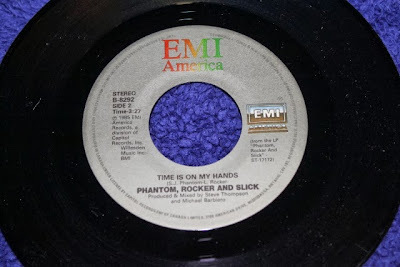 I recently picked up a few 45’s from the band Phantom, Rocker and Slick and they have proven to be a nice addition my Rockabilly collection. Phantom, Rocker and Slick consists of Slim Jim Phantom on drums, Lee Rocker on bass and vocals, and Earl Slick on lead guitar. Phantom and Rocker were previously the rhythm section for The Stray Cats with Brian Setzer completing the trio. 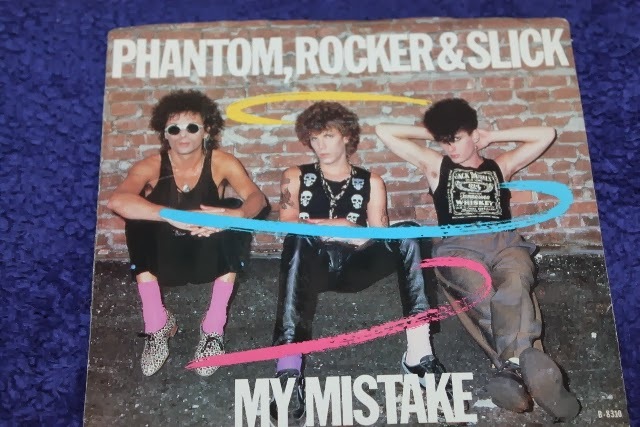 When The Stray Cats parted ways (the first time) in 1984, Phantom and Rocker began looking for a new guitarist to form a fresh new band. Earl Slick got the gig, and with his impressive resume it’s not hard to figure out why. He had a long history with David Bowie, in particular. He first went on tour with Bowie in 1974 replacing guitarist Mick Ronson. The LP David Live was recorded from this tour. After this tour he continued with Bowie and played lead guitar on the albums Young Americans and Station to Station. Slick stayed with Bowie until 1976, then returned in 1983 for a tour replacing Bowie’s lead guitarist Stevie Ray Vaughan. Slick also rejoined Bowie in the early 2000’s for albums Heathen and Reality, as well as the corresponding tours. It was a welcome surprise to also see Slick on the liner notes of the newest Bowie album The Next Day. Besides his work with Bowie, Slick also released two solo albums in 1976 called Razor Sharp and Earl Slick Band. Oh yeah, he did some guitar work with another few artists you may have heard of too…… playing guitar on John and Yoko’s album Double Fantasy as well as on Yoko Ono’s solo album Season of Glass. BUT, besides all that, he was a member of this great little band: Phantom, Rocker and Slick. Lee Rocker took care of the lead vocals in this band and he handled it nicely. Their first single, Men Without Shame opens with Slick’s dirty guitar filled with nasty squeals and distortion. Phantom’s thunderous sounding drums follow, not normal sounding drums mind you; I’m talking about those stadium filler sounding drums that only existed in the 80’s. This decade was also well known for the battle of guitars sound, and Slick holds his own nicely. These songs lean more towards rock and roll than rockabilly, but the influence is clearly there. Phantom and Rockers long history together is evident in their tight rhythm. Sure the song is dated, but sometimes I strive for that 80’s rock and roll sound. I really like how they never tried to make this band another Stray Cats, instead going for a fresh new sound. That being said, it never took off like the Stray Cats and, therefore, they only lasted a short while. Their debut self-titled album was released in 1985 followed by Cover Girl in 1986. 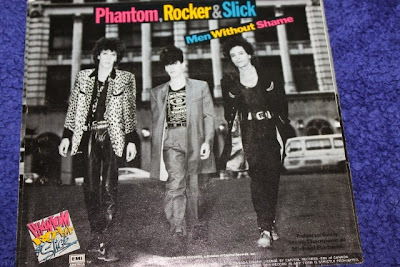 They parted ways after Cover Girl with Slick returning to session work, while Phantom and Rocker returned to re-form The Stray Cats with Brian Setzer. The two singles I purchased are Men Without Shame, which was their first, and My Mistake, their second. Keith Richards makes an appearance on My Mistake which was very cool. 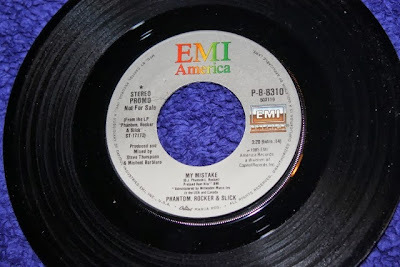 Both these singles are from their debut self-titled album. Be sure to check them out!